The magnificent city of Prague has mesmerized travelers for generations with its intoxicating blend of art and architecture. Walking its streets, you’ll find a city buzzing with locals and visitors alike, happy at their good fortune to be enjoying this beautiful city, in this moment in time. Today our Czech guide Ljuba joins us to explain why you too should come to Prague! Let’s start the discovery of this unique European capital with a closer look at its architecture. Prague itself is a wonderful gathering of various architecture styles and a real paradise for anyone in love with architecture. You will have the chance to gaze at fortified monasteries from the Middle Ages; one of the best example is the Velehrad Monastery, built in the 13th century on the slopes of the Chřiby Hills. The monastery is the most significant pilgrimage Church in the Czech Republic, as it welcomes every July tens of thousands of people for the annual National Pilgrimage. If you are fond of this architectural style, Osek and Nepomuk monasteries are must see places as well. Looking for Gothic architecture? Do not leave Prague without taking a walk in the Vyserhad quarter. Meaning “upper castle” in Czech, Vyserhad is a historical fort located in Prague, which is packed with Gothic architecture treasures, such as the Basilica of St Peter and St Paul. The basilica and its incredible hollow spires, was rebuilt in a Gothic and then neo-Gothic style after a fire that occurred in the mid-13th century. You will also love visiting the Emause and Virgin Mary of the Snow cloisters in Prague, which are very famous for their unique Gothic style. The Vladislav Hall, located in Prague Castle, will offer you a perfect example of the Renaissance style. The hall was one of the first Renaissance buildings to appear in the Czech Republic at the end of the 15th century. Characterized by the presence of columns, pilasters and lintels, as well as the use of semicircular arches and hemispherical domes, the Renaissance style is a delight for the eyes. For connoisseurs and admirers of other architecture styles, Prague will keep on amazing you with gorgeous Baroque buildings, Rococo and Classicism summer houses, or Romantic palaces. Prague is also known for its rich and mystic history, which explains why the city was nicknamed “Magic Prague”. It is under the reign of Charles IV, during the 14th century, that the mystical dawn of Prague began. Indeed, the sovereign had a great interest in esoteric sciences and it influenced deeply the decisions he took during his reign, such as the location of the New Town or the symbols we can see today on Charles Bridge. Back in the Reign of Emperor Rudolph II during the 16th century, the European Metropolis was a safe heaven for alchemists and astronomers from all over Europe. Many of them such as Tycho Brahe, a Danish astronomer who is now buried in the Tyn Church, and Johannes Kepler, a German alchemist and astronomer, had laboratories throughout the city. Prague is all about fabulous landscapes, magnificent architecture, and a touch of magical history, but there’s more: gastronomy is everywhere in the city. So if you are a foodie, you should definitely come to Prague! The capital counts numerous food markets taking place all year long. We particularly enjoy the Naplavka food market, which gathers hundreds of people each Saturday morning along the Vltava River: fresh fish, sea food, bio vegetables, home made beers and ciders, cakes and sweets, food truck and their delicious culinary experiments... what else could you ask for? You’ll be wrapped up in a warm and musical atmosphere, with a fantastic view on the river and most importantly, you will be surrounded by locals. The city is welcoming many food festivals as well, with various themes, which make these events very popular in Prague: burgers, cupcakes, candies, street food or river food festivals are just a few examples of what you can expect. Prepare for your taste buds to be amazed! 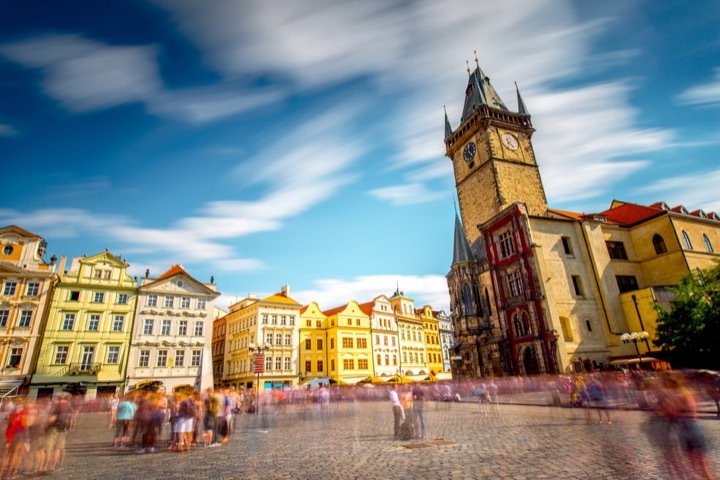 Are you heading to Prague this summer or fall? Or maybe it’s a part of next year’s travel plans. Whenever you visit, Ljuba is here to make your visit even more legendary.